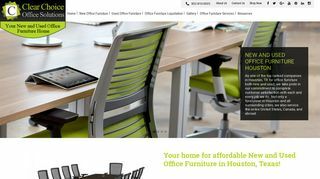 Are you looking for affordable office furniture? At Clear Choice Office Solutions, we specialize in new and used office furniture offered at great prices. We carry a full line of new and used brand name cubicles, desks, chairs, file cabinets, conference tables, reception desks, lobby seating and more. Our knowledgeable and friendly staff can provide space-planning services, onsite consultation and project management. Our goal is to offer high quality products and service that exceeds our customer’s expectations.